What’s more delicious than slow-roasted chicken on a summer day? 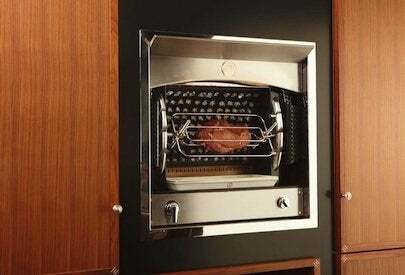 Fans of fowl (and fish and other meats too) will be happy to learn that La Cornue has created the first UL-approved gas rotisserie—and this built-in doesn’t require a flue or special ventilation. 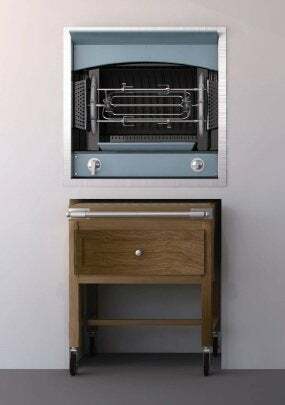 Dubbed “Flamberge”, the oven measures a dainty 32” square by 15” deep. Synthetic wicks, which are housed in cast iron channels, line the rear concave wall, ensuring the flames never touch your food. And it’s all powered by a 27,000 BTU natural gas burner (propane option also available) and a 120-volt power supply for rotating the three spits. 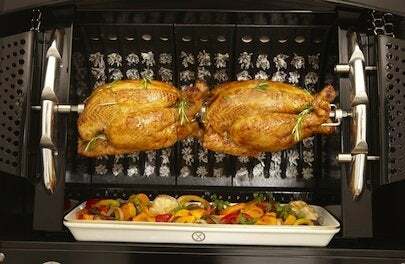 In rotisserie cooking, the turning of the spit distributes natural juices. That means no basting and no dried-out meat. A porcelain tray collects run-off juice (which can be used for finished dishes). The tray, spits, and fish basket (included) are all dishwasher-safe, making clean-up a breeze. Manufactured by hand just outside Paris and distributed in the U.S. by Purcell Murray, this kind of luxury doesn’t come cheap; pricing starts at $10,000 and tops out at $13,600. But La Cornue’s long tradition of handcrafted ovens means they stand behind what they make. Founded back in 1908, the company’s craftsmen take their time with each order, putting the lead time at 12-16 weeks. La Cornue is known for traditional styling and a wide range of colors, and Flamberge is no exception. The rotisseries is available in 20 standard colors (plus five premium colors) and five trim options, so you’re guaranteed a hue that will match your kitchen. A rotisserie that evokes summer while allowing you to skip standing over a hot grill, the Flamberge fulfills your barbecue fix year-round. Visit La Cornue or Purcell Murray for more info.